The new (in 2017) Sony ICF-506 has been quite a surprise here. At a current street price of $44.95 it is an unusual combination of performance versus price. Initially I didn’t expect much from it – one reader had told me it had unusual tuning characteristics but I wasn’t clear on exactly what that meant. He surmised it meant that it was a DSP Chip (Digital Signal Processing) design and now that I have tested the radio I agree with his assessment, and I must say that the way DSP has been implemented in an inexpensive analog-tuned portable is interesting with both benefits and one potential drawback. Initial Observations: I found the ICF-506 to be well packaged and it is a very attractive medium sized radio, measuring about 8 ¾” x 5” x 2 ½”. It features a very readable dial scale, a 4” speaker and an amplifier rated at 640mw which is very good power for this class of equipment. There is a convenient fold-away carrying handle, absent on so many of today’s radios. It runs on 3 AA batteries or a built-in 120 volt AC power supply – a decided plus. However, its battery life is specified at an unimpressive 35 hours…more on that later. * There is a stereo earphone jack which will send audio to both sides of stereo earbuds but the audio is mono only…no stereo FM. Controls are basic – an On/AM/FM slide switch, volume and tuning knobs, plus Power and Tune LED’s. The US version covers the expanded AM band up to 1710 KHz while other country versions top out at 1602 KHz and operate on 220/230 volts. Performance: Here is where I was surprised. As I said I didn’t expect top performance from this radio but on my initial band scans I was impressed by the ICF-506’s sensitivity and selectivity. It was good enough that I wound up comparing it with several radios to see where it would fall on my AM and FM Mega Review lists. But first a note about that quirky tuning behavior. Although the ‘506 is described as an analog radio that is only partly correct. True, it appears to be analog with a slide rule dial, tuning knob and no digital buttons of any kind. But when you tune the radio you will find that it “hops” from one station to the next, and once it is locked onto a signal (and the Tune LED illuminates) there is no fine tuning within that signal’s passband. You can untune it a bit and the Tune LED will extinguish but reception in that mode is not optimized…you always want to tune until the LED illuminates. As you continue to tune the radio jumps to the next station and locks onto it. This is true on both AM and FM. This feels exactly like tuning an older FM radio with AFC (Automatic Frequency Control) engaged. Traditional analog radio lovers will not like this as it does not give a smooth, progressive tuning feel where you can fine tune a signal as you like. However, for today’s typical user this could be considered a plus in that if you are hearing a station and the Tune LED is on you will know you are getting the best reception the radio is capable of. It is true that sometimes you will land on a station and the Tune LED won’t come on…if you slightly retune you will find that the LED will come on and the signal will be louder and clearer. One other point is that if you learn the feel of this tuning you can still get relatively good selectivity of weak signals even adjacent to stronger ones. In my location, I have fairly strong signals on 560 and 580 with an extremely weak signal sandwiched between them at 570. On casual tuning the ICF-506 will jump between 560 and 580 missing the weaker 570 between them but if you carefully tune slowly it will find and lock onto 570 and separate it quite well…but it does take some patience and care to learn this feel. AM/FM Performance – OK, we’ve discussed the ICF-506’s design and feel but how well does it perform? Here the news is amazingly good for a radio that typically sells for around $45. It’s AM and FM reception are both the best I have seen in this class of equipment. It’s AM comes in at an impressive *** 1/2 Stars in my AM Mega Review and the FM ranks **** in the FM Mega review. If you haven’t tried a recently-designed FM portable radio you’ll be impressed. Again, due to the way this radio jumps from one station to the next it is sometimes a bit tough to make it find a weak station adjacent to a stronger one but with slow, careful tuning its ability to receive them is actually very good if you are careful, and once it is locked on it doesn’t drift off. Sound quality is quite clear and natural on FM but a bit on the muffled side on AM – I could wish for more AM crispness, but I played the radio for many who are a little less fussy than I am and most found it OK.
*Battery Life & AC Operation: The ICF-506 has a relatively short specified battery life of 35 hours, based on the fact that it runs on small AA cells and has a beefy amplifier and speaker. However, it does feature built-in AC power with no external power supply wall wart needed, so for desktop use it is very convenient. I must admit I was surprised by Sony’s battery life specification and wondered if this 35-hour spec was perhaps overly conservative, so I decided to measure its current draw. Today’s better alkaline AA cells are spec’d at approximately 3000 mAh (milliamp hours), however measuring current draw proved problematic. At minimum volume the ICF-506 drew about 21 ma. With the volume increased to a normal listening level the draw increased to about 30ma which would equate to 100 hours of operation, but increasing the volume to a slightly higher level that draw jumped to 100 ma which would mean only about 30 hours of run time. Increasing the volume to loud levels the draw jumped drastically but I didn’t think those measurements equated to real world conditions. Since the current draw varied so wildly with volume setting…more so than many radios, I decided to do a real-world battery life test. To that end I put in fresh alkaline cells and ran the radio on AM at what I would call a “reasonable” volume…between 10 and 11 o’clock on the volume control, where I could easily listen to a program comfortably anywhere in the room. I ran it for days at stretches up to 10 hours at a time which would drain the batteries faster than when used for shorter periods which is more typical of average use. My results were surprising – the radio ran for over 75 hours before the BATT light went out, but the radio continued to soldier on for another 10 hours for a grand total playing time of about 85 hours until the unit shut down. But remember…listening at low levels will dramatically extend battery life and conversely, listening loudly will dramatically reduce it. Another interesting observation is that the BATT light actually gives a fair warning of when the batteries are getting weak. Conclusions: The Sony ICF-506 is unusual in a few ways. The most exciting aspect is how great its reception is for this price range…among the very best I have seen in an inexpensive paperback book-sized portable. Another positive is the built-in AC power supply – for all day/desktop use this means you can plug it in without the nuisance of an external wall-wart power supply…a big plus. On the negative side is its AM sound which is a bit less crisp than many such radios, although many people will find its sound just fine, and it sounds quite nice on FM. Overall a great value in a work horse radio. Comparison To ICF-506 Above: As I was working on the ICF-506 review I became aware of the apparently very similar ICF-19. 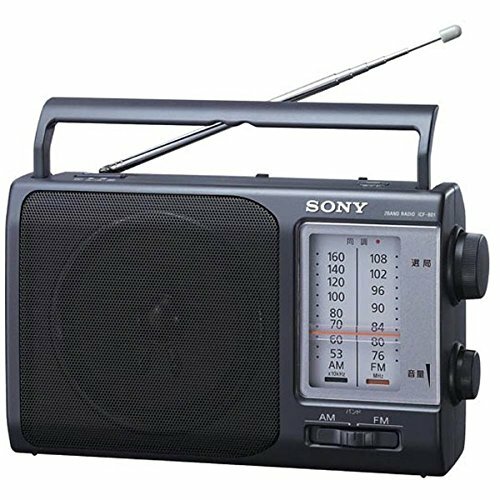 In fact, the radio looks identical to the 506 except it has a carry strap instead of the (preferable) fold down handle, it has no built-in AC power supply (and in fact no external power input jack at all), its cabinet is about ¼” deeper, and it runs on D cells rather than the AA cells of the 506, therefore boasting a much greater specified battery run time of 290 – 400 hours depending on volume and AM or FM mode. I would say this makes the ICF-506 better suited for AC use while the ICF-19 would be better for battery use. The ICF-19 has a rated output of 500 mw…close to the 640 mw of the ICF-506 but in use I would say they sound identical – I could discern no differences between the sound quality or volume of these two radios. AM and FM Reception was also identical and I suspect they use the same or at least a closely related DSP chip. All of my other comments on the ICF-506 can be applied to the ICF-19…they act and feel like the same radio other than the differences I’ve pointed out. 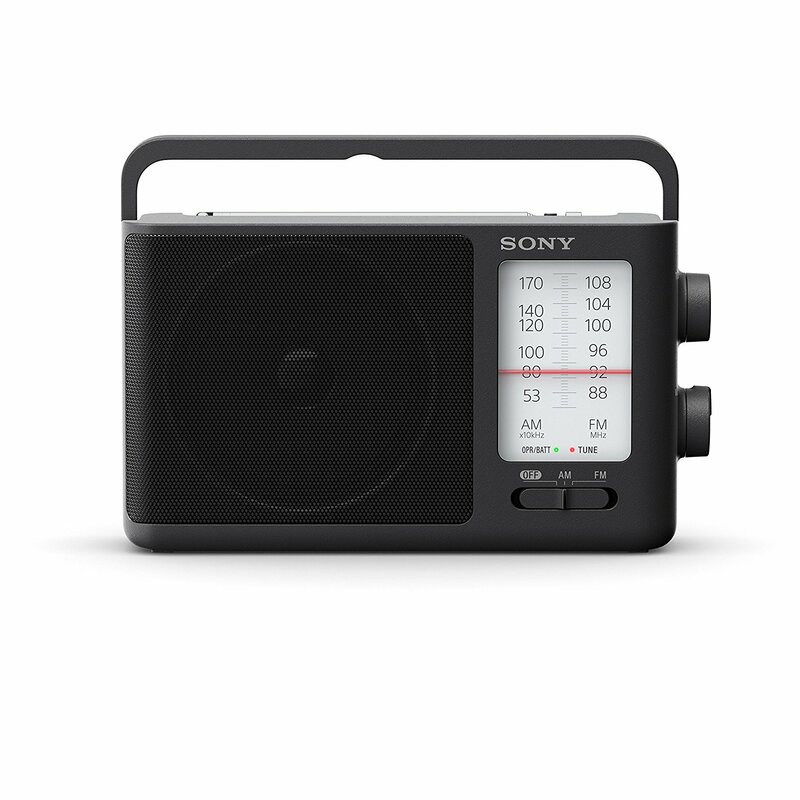 The take-away is that the longer battery life makes the ICF-19 preferable to the ICF-506 if you are usually going to use the radio on batteries…but why did Sony omit the great carry handle of the 506? Sony ICF-801 Here’s an old-school Sony model which was introduced several years ago but is still available through several sources. Designed for the Japanese market this radio was never sold by Sony directly in the US, although it has become available here through Amazon, eBay and many of the usual on-line sellers. I thought it was worth including in this report because it is the same category of radio as the two above – but in terms of performance it is quite different. Comparisons with ICF-506/ICF-19 Above – The ICF-801 demonstrates some outstanding strengths and some serious drawbacks in comparison with those radios. This is a completely different animal, and the differences may make it just the radio for you, or it might be a poor choice – it depends on how you will use it and what you value most in a radio. The ICF-801 is a true is all-analog circuit – no DSP chip here. It does not include the Expanded AM Band for the US…mine topped at about 1630 KHz. The Japanese FM band begins at 76 Mhz rather than the US standard 88.1 MHz, so for us, the usable part of the FM band is reduced to a smaller segment of the dial making the dial markings more closely spaced. The ICF-801 runs of three C cells which should provide good battery life. There is a built-in AC power supply so no wall-wart is needed to plug it in…an advantage. The Japanese version is designed for 110-120 volt operation but other versions are marketed elsewhere. The AM band is the good news here, both in reception and sound quality. 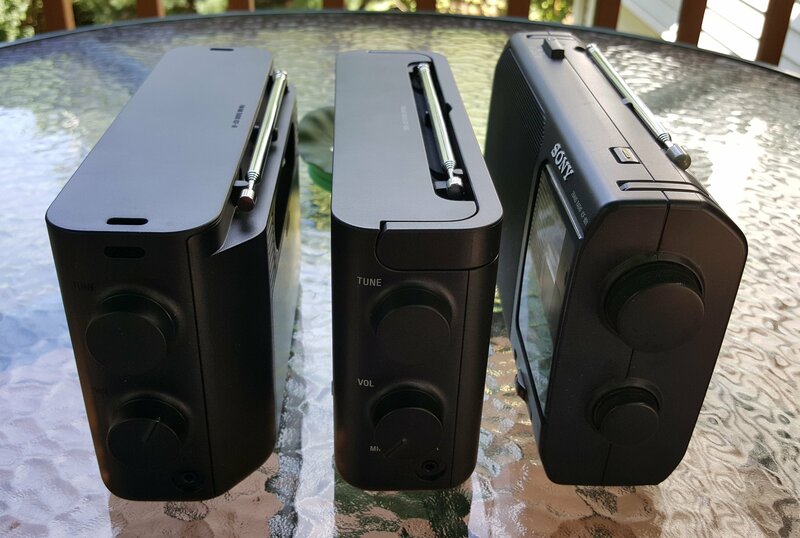 The ‘801 received AM stations as well as the two radios above, which is to say it is very sensitive and selective for this class of equipment and fits into the same ***1/2 star group in the AM Mega Review. Plus, being a true analog design, it tunes as a traditional radio tunes, which is to say it is natural and great for band-scanning or fine-tuning a signal for best overall reception. The AM also produces a very full, rich sound for this size radio…on AM it sounds much nicer that the two radios above which are rather limited in their frequency extremes by comparison. Again, they sound OK but side-by-side it is obvious that the 801 has a wider bandwidth sound and it is nicely balanced…full and rich sounding by comparison. I really like it. The FM story on the other hand is disappointing. Typical of most less expensive, pre-DSP designed radios, the ICF-801’s FM performance was barely average in terms of selectivity. Although it seemed reasonably sensitive to weak signals, and therefore would be OK in a remote location, it’s poor selectivity kept it from receiving many closely-spaced FM signals which I could receive on the ICF-506/ICF-19. In fact, a suburban-grade signal (I’m about 15 miles from its transmitter) on 106.9 MHz was spread out so much it obliterated other signals on 107.3, 107.5 and 107.9, all of which I could receive on the other radios. For average FM listening it was OK…most of my usual stations came in just fine on it…it’s just not a good radio for picking weak signals out from between stronger ones. Sound on FM was good although a bit brighter than the AM sound. 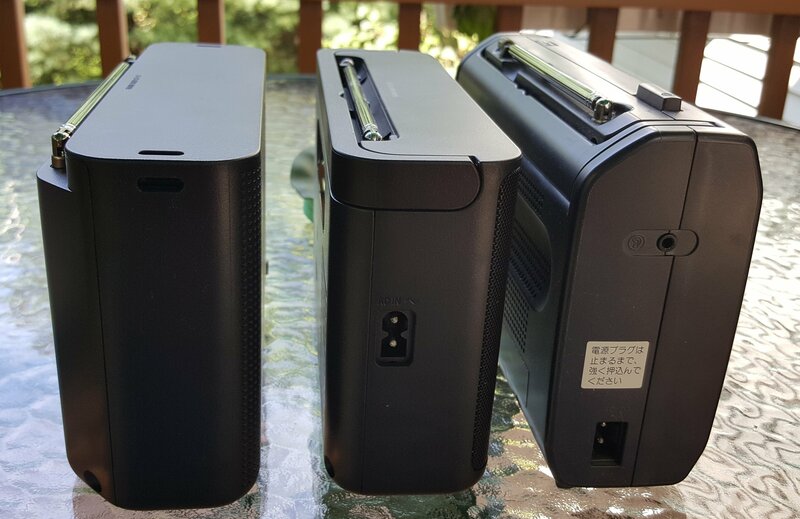 Conclusions – It’s Your Choice: It turns out to be relatively easy to choose which one of these three radios might be the one that works best for you. In this price range, I can recommend all of them but here is a nutshell comparison to help you choose. ICF-506 – Built-in AC power – best for all day use as in an office. ICF-19 – Best for long battery life with its three D cells but no AC option. The two above are identical in their performance in every other detail. ICF-801 – Fully analog, natural tuning feel, AM sound quality far superior to the two radios above. AM reception very similar, FM far less selective.